I could not believe what I was hearing. One minute I was sitting happily in my office in Harare, looking forward to the weekend. My husband’s phone call from the farm 70 kilometres away changed my life in the blink of an eye. Winnie had immense character and charm. He had the beautiful Jack Russell eyes, a brown/green colour with a dark line around them like eyeliner. He was mainly white, with a couple of tan patches on his body, and the typical tan mask on his face. He had a great big chest and strong front legs, but he sort of tapered off at the other end, making him look like a miniature bull. His tail was long and thin, with a kink near the end. My stepdaughter was living with us at the time, and it was initially for her that I bought this ‘left over’ puppy. She took him to bed with her every night, together with our first Jack Russell, Phoebe, who was by then a mature 2 year old. Phoebe and Winnie became inseparable companions, and Phoebe suffered as much as we did after his death. I had come late in life to dogs. I arrived in Zimbabwe from the UK in 1995. By 1996 I had taken on Phoebe, and I was instantly smitten with the cheerful, naughty Jack Russell character. A year later Winnie arrived, to give us so much laughter, so much entertainment and happiness. He liked to chew on old socks of my husband’s, and one or two would always be lying around the place. “Sockie, Winnie, where’s your sockie?” Winnie would gallop around the room, hunting out a sock. He would bring it to me and then I would hold one end whilst he growled and fought with the other. 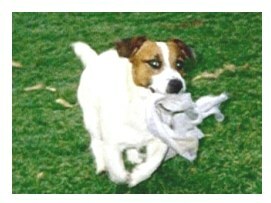 I have a photograph of him tearing across the lawn with his “sockie” in his mouth. When he decided it was time for somebody to get up and play with him, he would jump onto the bed and make a funny growling noise, almost as if he was trying to talk. What a happy little dog he was. Unfortunately, Africa is a dangerous place for dogs. Especially for terriers like Winnie, who have absolutely no fear, and believe that they can take on the biggest opponent. I lived in a state of simmering anxiety for this dog. Our house at the farm was situated on the edge of a large and beautiful dam. Our lawns ran down to the water’s edge. We were continually calling Winnie, retrieving him from whatever fight he thought he was going to win. On more than one occasion we had to go out in the dark with torches to dissuade him from taking on a very large and aggressive otter. The otter would stand taunting him in the shallow water, as though beckoning and saying “Come on, punk, make my day”. In early 1998 we heard that there were pythons in the dam. Our neighbours’ large puppy was found floating near their house. It had been drowned. We talked about the need to put up a fence across the water line, but unfortunately we were too late to save Winnie. On Sad Friday, it seems that the house-maid had locked the two dogs out of the house whilst she was hoovering. I have never recovered from the bitter knowledge that, had I been there, I would have saved Winnie. I would have heard the particular barks that mean Incoming Enemy, but unfortunately none of the staff noticed in time. This was a source of terrible sadness to me. When the two gardeners saw Winnie in the water with the python, they were so terrified that they did not know what to do. Rather than thinking to use the phone, one of them ran 300m to fetch my husband from the farm offices. Chris said that when he arrived, they were dancing around with the dinghy oars. The oars were 2m long, but they were 4m away from the snake. Chris waded into the shallow water with his shotgun. He grabbed the python, which immediately released Winnie, but it was too late. He had drowned in 4 inches of water. Chris shot and killed the python, and retrieved our poor dead dog. He was unmarked apart from four fang marks around his face. I sat numbly in my office after the devastating phone call. I will never forget the terrible shock and grief, and the feeling of unreality. I could not believe that my worst nightmare had come to pass, on a lovely, clear, sunny morning. I called Chris back and asked him to bury Winnie before I got home. I knew I could not cope with seeing him. I remember driving back to the farm, screaming at the top of my voice. I was by then totally unhinged. I arrived to find that Winnie had been buried in the garden, very carefully and very deep, so that scavengers would not find him. I wandered about in a daze. I then noticed that the house-maid had taken his basket from the house, removed the blanket,and put the basket in the utility room with some brooms propped up in it. I have never been nearer to physically attacking somebody than I was at that moment. It is impossible for Africans to understand the peculiar attachment of a British person to their pet. Chris, who grew up on a farm in Rhodesia, was sad but philosphical about the death. During his lifetime he had seen so many dogs die, killed by snakes, under tractors, by tick bite disease. However, even this big strong man wept for Winnie. I know, I know that this was ‘only a dog’, and that people lose husbands, children, parents. However, it was pointed out to me that grief is what I was suffering, and that my grief was valid. It certainly was real, and it was terrible. Over the weekend I drank myself senseless. Each morning when I awoke there would be a moment of peace, until I remembered, then the crushing, unbearable pain would return. I became obsessed with the idea that we were all warm and cosy indoors, and that Winnie was lying outside, alone in the cold. I wanted to dig him up because I could not accept the reality of his death. I removed every mat he had sat on in the house, and bought replacements. When I returned to my office after the weekend, my boss took one look at my face, with my eyes swollen almost shut from crying, and decided that I must spend the day finding another puppy. Through my vet I traced a woman in Harare who had Jack Russell puppies. This kind, kind woman had already sold the last male puppy, but she telephoned the purchaser, who immediately agreed that I must have him. I will always be so grateful to those lovely people, who helped so much in my darkest time. So Walther entered our lives in May 1998, and helped to assuage the terrible grief and the absence of Winnie. Poor Phoebe enjoyed having a new companion, although she never recovered from the loss of her first playmate. From the day of Winnie’s death until we left the house a year later, she would sit at the edge of the dam all day, looking for him. When she heard a jingling sound, like his collar used to make, she would jump up and search around for him. It was the saddest thing to see. Walther and Phoebe are still with us, plus two additional much-loved dogs. Walther is now a beautiful 5 year old Jack Russell, with a wonderful personality and a continual need for lots and lots of attention. I am neurotic about the safety of my dogs; I go to ludicrous lengths to ensure that nothing, but nothing can happen to them. People think I am a little demented, but Chris understands why I am like this. I was deeply traumatised by the sudden and awful occurrence. It took me years to recover from the dreadful and untimely death of our dear Winston, and in some ways I never will. A month or two after Winnie died, I opened the Zimbabwe Commercial Farmers’ Magazine to find an article entitled “Snake Hate Club”. A young farmer described how he had lost both his beloved Staffies to spitting cobras. His grief and pain were palpable through the terse and unemotional prose. A few more farmers contributed similar stories over the months, and a big battle ensued on the Letters Page. The conservationists wanted to see all species of snake protected, the farmers wanted to see all species of snake wiped out. I know where I stand – I consider myself to be a founder member of the Snake Hate Club. Patricia, I’m sorry for your loss and i feel your pain, i have been keeping dogs as pets since 1991 and every time i lost a dog (due to old age or illness) i would cry uncontrollably for days. In fact there was a day I thought i’d lost my then 7 weeks old doberman which i just got the day before, i almost ran mad with grief. However, generalized comments like “Africa is a dangerous place for dogs” and the notion that Africans don’t understand a bond man can have with his dog is rather unfortunate. I am Nigerian and I know lots of Nigerians and other Africans who love their dogs deeply and cannot imagine or stand the thought of losing their dogs. Winnie was just unfortunate to be around people who weren’t attentive and observant. Africa is very safe for dogs depending on your location and just like any other place in the world, one’s location should be put into consideration before deciding on a breed of dog, it’ll be insensible of me to own a Doberman on a farm in Alaska or Russia, but quite sensible to own a German Shepherd, Caucasian Shepherd or Boerboel if i live on an African farm that is situated on the edge of a large and beautiful dam and have lawns that run down to the water’s edge.